I’m trying for my third NaNo in a row this year, despite being in the middle of my second MBA class. I missed all my previous goals to finish book 2 of Red Slaves, so for some reason I have this thought that I’ll finish both that and book 3 in November. I’ve developed a daily timetable to remind me and my husband of which hours are blocked off for furious writing. After sleeping, eating, day job, and school, I think I’ve carved out at least 72 hours over the course of the month to pound on the keyboard. If I’m super-efficient, that should add up to 72,000 words and 2 novels. That’s the ultimate question: With everything else going on, can I be super-efficient? We’ll answer that question here, this month, and report next month. OOOOHHH….oh boy. Well, I’m right there with you. 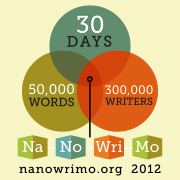 I succumbed to the pressure and joined Nano. O.o Let’s both finish..something. Anything.